In a week where six men in Leicester were jailed for attempting to stir-up tensions between Sikh and Muslims, a judge praised community leaders from both faiths for preventing a further discord between the two faiths. The six men pleaded guilty to stirring religious hatred, assaulting men in a car, and shooting another victim. Five out of the six individuals are Sikh. In June 2013, at a time when stories about child grooming became headline news, the group, armed with hockey sticks, chains and other weapons, attacked a car containing two Muslim men. Both escaped the vehicle unharmed. Some weeks later and one of the convicted men created an anti-Muslim Facebook page. Others in the group created a fake website in the hopes of luring Muslim men on the false pretence of meeting an underage Sikh girl. That scheme entrapped two men, one of whom was a vulnerable Sikh, who was tricked into sharing an indecent photo of himself, a photo later used to further embarrass the victim at his workplace. The group convinced the other entrapped male to meet at a pre-arranged location. Upon arrival, the group assaulted him with weapons and one of the convicted men, Parwinder Baning, 21, shot the individual with a BB gun. Parwinder Baning previously appeared in court after admitting possession of prohibited weapons. Baning’s weapon haul included imported knuckledusters, imported pepper spray, an imported extendable baton, knives, stun guns and concealable stun guns. One stun gun emitted 100,000-volt shock (twice as powerful as a police issued taser). Officers discovered 37 knives at his address – including martial art knives, hunting knives and throwing knives. Ownership of said weapons only becomes a criminal matter once they are carried in public, which explains why the police confiscated then destroyed the cache. Online receipts indicated that Baning awaited further weapons not yet in police hands. In court, Baning received a seven-and-a-half year prison sentence (the longest sentence of the group) in light of the above evidence. A string of offences included admitting to the possession of a bladed article, conspiracy to commit assault, actual bodily harm, possession of an imitation firearm, two counts of purchasing prohibited weapons, two counts of improper importation, attempting to import and importing prohibited goods. 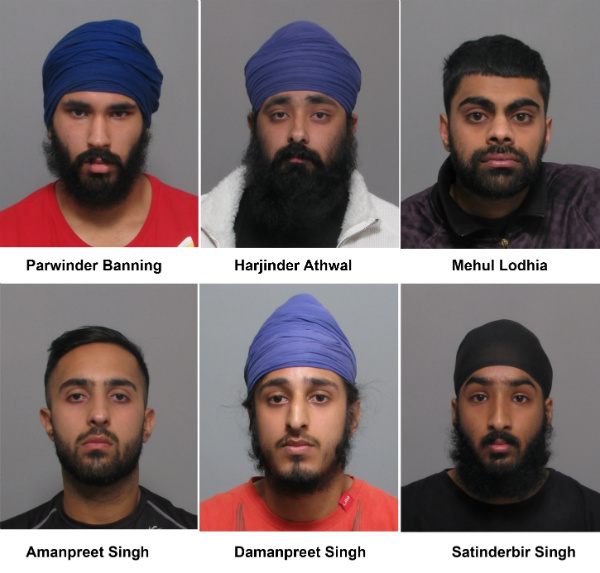 Harjinder Athwal, 25, received a two-and-a-half year sentence for a string of offences that included publishing or distributing material with intent to stir up religious hatred and actual bodily harm. Mehul Lodhia, 24, admitted importing a prohibited a prohibited weapon and conspiracy to common assault, at an expense of a three year prison sentence. Amanpreet Singh, 25, received two years in prison for affray. Damanpreet Singh, 19, admitted a string of offences that included publishing or distributing written material with intent to stir up religious hatred. He received a four-year prison sentence. Satinderbir Singh, 20, received a 15-month prison sentence after admitting to publishing or distributing written material with intent to stir up religious hatred. As the trial progressed, Judge Dean revealed that brothers Amanpreet and Satinder Singh instigated the assault on the car containing two Muslim males. The latter is also responsible for creating the anti-Muslim Facebook page. A page dedicated to spreading and feeding “myth, exaggerations and paranoia.” The other defendants also posted messages on the page. In light of the incidents, community leaders from both faith groups worked with police to ease any interreligious tensions.